The number of immigrant "family units" apprehended while attempting to enter the US through its southern border soared to 12,774 in August, up from roughly 9,247 in July, according to statistics released by the Customs and Border Patrol (CBP) agency. Another 3,181 family units who arrived at official ports of entry were "deemed inadmissible" in August, a slight increase from the previous month. 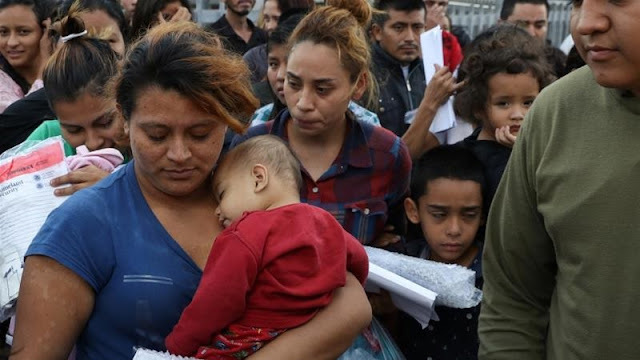 CBP Commissioner Kevin McAleenan said on Wednesday that "legal loopholes" allowed for the increase, adding that "we’re not surprised by it, but it’s been a very stark trend". Families accounted for almost a third of apprehensions on the southern border in August. The numbers shine a light into the impact of the Trump administration's "zero tolerance" immigration policy introduced in April, which resulted in the separation of more than 2,500 children from their parents. President Donald Trump effectively ended his administration's own practice of separating families in June with an executive order amid heavy criticism, though hundreds of children remain separated from their parents and guardians. Last week, the Trump administration moved to abandon a court settlement that limits how long immigrant children can be kept locked up. The administration proposed new regulations that would allow the government to detain families until their immigration cases are decided. The settlement, commonly called the Flores agreement of 1997, limits the amount of time minors can be detained to 20 days and lays out the conditions they must be afforded. The administration claims sidestepping the Flores agreement will speed up the handling of asylum requests while also deterring people from crossing the border between official ports of entry. The administration also announced on Tuesday that it will expand its tent camp for immigrant minors apprehended at the border in Tornillo, Texas from 1,200 beds to 3,800. August's statistics come as the US midterm elections are approaching and immigration remains a key issue in campaigns across the country. Immigrant advocates claim that people will continue to come to the US due to difficult situations at home. Ali Noorani, executive director of the National Immigration Forum, an immigrant advocacy group, told USA Today that most of the people arriving to the border are "fleeing gang violence and instability in Central America. "Even with all of the news about family separation, zero-tolerance policies and detention, parents will take the risk and come to the [US] to try to keep their families safe," Noorani was quoted as saying.